There is a trail we all must walk. It begins at birth. It twists and turns through lush forests and barren deserts, under clear, star-filled skies and swollen storm clouds, up steep mountain passes and along lazy sweet-tasting streams. Eventually, we find ourselves approaching the heavy mists of death. Eyesight cannot pierce the mists. Rarely do we hear anything from the other side. We do not know where the trail through the mists leads because the mists of death form impenetrable walls. I have lain in my own deathbed. Twice. Through two attempted suicides, my trail slowed as it turned uphill and towards a cliff where the mists had gathered. The tip of my nose pressed into the deep chill. My cheeks were almost frostbitten with the violence I did to myself. While I was at Unist’ot’en Camp, I wrote an essay called “Think About Your Future” about how dedicating ourselves to saving what is left of the world is the best action we can take to protect our future. Part of my motivation in writing that essay was to defend young activists from friends and family who try to steer us away from activism by warning us that we’ll need jobs, benefits, and pensions. They try to set us back on the mainstream path by telling us to think about our material future – as if our material future does not depend on a healthy land base. Since writing that essay, I’ve felt that I left something unsaid. The essay operated partly as a justification for devotion to environmental causes as well as a reminder of the primacy of the natural world. Bank accounts, of course, are meaningless if there is no clean water to drink. What I’ve realized since writing that essay and reflecting on my own experiences is that we do not need to appeal to the future to demand environmental action. All we have to do is look to the here and now. Our future, of course, is being physically and spiritually destroyed. Our chances for survival diminish with each passing day. But, our present is being destroyed too. 200 species a day are going extinct. That’s not in the future. That’s right now. In the time it takes me to write this sentence – about 15 seconds – another woman is battered. Her eye is blackening and her lip is swelling. Right now. 72 acres of rainforest are destroyed every minute. When you finish reading this essay, depending on your speed, another 144, another 216 acres will be gone. 300 hundred tons of topsoil are lost every minute. That’s this minute and the next minute and the next forming a deadly velocity that just keeps picking up speed. How can we think about the future knowing that all of these atrocities are happening right now? There’s another reason why appealing to the future might be problematic. What happens, for example, when there is no future to appeal to? What if the near-term human extinction folks are right? University of Arizona Professor Emeritus of Natural Resources, Ecology, and Evolutionary Biology Guy McPherson sees human extinction by 2030. Many scientists are predicting an 11 degree Fahrenheit temperature rise by 2100 making the Earth uninhabitable for humans and most other life forms. Then, there’s the merely common sense analysis rooted in the reality that a system based on infinite growth on a finite planet is suicidal. What do we appeal to when the future becomes so cloudy we cannot conceptualize it? And that brings me to another point I made in “Think About Your Future.” I wrote, “Unfortunately, the dominant culture isn’t just killing itself, it wants to take as many of us down with it as it can. It wants to commit murder-suicide.” Since writing that sentence, and reflecting on my own experiences with suicide, I realized that the lessons I learned in the long moments before what I thought would be my death can be applied to this destructive culture. We all know the over-used versions of the cliché that says “all we have is now.” I learned on my own deathbed where I deliberately took too many pills to destroy my own future the reality of that statement. When you face the total nothingness of death, when you strain your senses to feel something, anything through those heavy mists of death, when your future is stolen from you, the present really does become all you have. It is precious. You treasure it. You cling to every aspect of it in the hopes that you can coax some spark of the future out of it knowing that a spark could hold the key to your survival. The dominant culture is hurtling down the trail of life to its own death. As things continue to get worse, those of us aware enough are going to be caught in the long moment before plunging into the chilling mists of our cultural death, our spiritual death, and maybe even our physical death. Perhaps, we are caught in that moment right now. Sit with that realization for a moment. Be honest. Let it weigh on your heart. Think about your mind slipping away like the sand in an hourglass emptying. Feel the beats of your heart slowing until it cannot push your life-giving blood through your veins. Sense the loss of control in your muscles. First your toes won’t wiggle, your fingers won’t grasp. Then, your legs won’t bend and your arms are asleep. What does this do to you? How does this make you feel? Does it help you love each breath you take just a little more? Does it make your coffee taste better? Will you kiss your lover slower, more deeply tonight? Will you pledge to fight for every single instant of beautiful life you can possibly get your hands on? The good news is there are sparks in our present that can be fanned into the roaring flames of survival. For me, this spark has been provided by the grassroots Wet’suwet’en people – especially Freda Huson and Dini Ze Toghestiy – who are digging in on their homelands at Unist’ot’en Camp to stop pipelines from being built. They are certainly looking out for our future and for our future generations, but Unist’ot’en Camp is also protecting the land right now. If the pipelines cannot ruin their land today, then they may not ruin their land tomorrow. But, if the pipelines ruin their land today, they may be ruining their land for a long time. 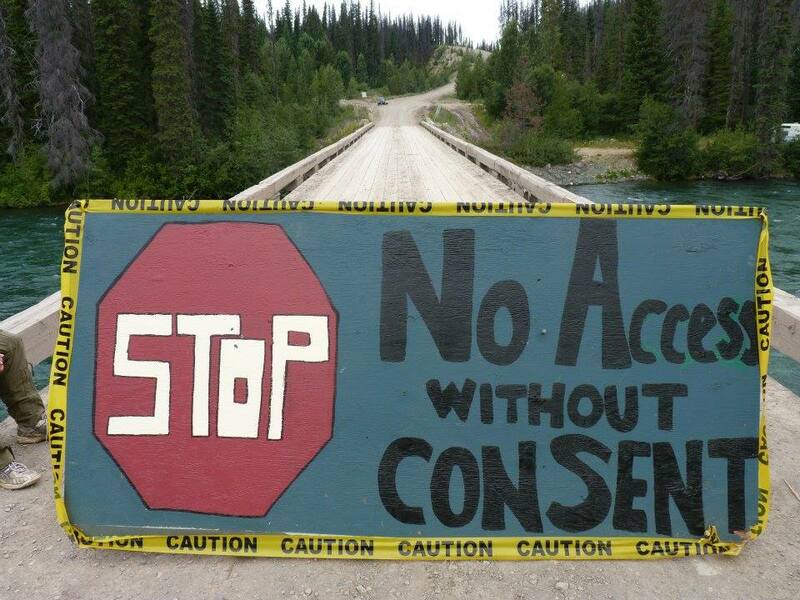 It’s not just at Unist’ot’en Camp where the present is being defended. Everywhere you look beautiful things are under attack. Ask yourself what it is you love. Then, fight with everything you’ve got – right here, right now – for your beloved. We never know when we will die. But in the meantime we can use our life energy, to the extent we are able, to try and make the world a better place or make a difference. That’s the real drama of life. What happens after we die will take care of itself. It takes courage just to live and to try to accomplish something with our lives never knowing if we will be successful or if the planet will survive or if we will even make it to tomorrow. Every day we do something we believe in is a victory in itself. Jobs, benefits and pensions are meaningless if that is all we are living for. Better to take a chance and really live for something. Life is risk. There are no guarantees. Not even jobs, benefits and pensions are guarantees. They can all be snatched away in a second as many people who put all their stock in such things can attest. As one disc jockey signs off, “If you don’t stand for something, you’ll fall for anything.” Better to think when you die that you believed enough in your own thought processes and had enough faith in yourself to just go for it. Let the chips fall where they may. Will, you are smart enough to make your own way through life and live by your wits. You don’t need the conventional security blankets that most people can’t live without. Thank you very much for your words, John. And thank you so much for all the hard work you do with your writing for our land base. I strive constantly to keep the fact of my own death central to my spirit. It makes life even sweeter. Glad you found your spark, Will. Brave… like how you circled back around to the present alongside the depth and breadth of our relationship to it… simple but poignant realization. Here and now. “The good news is there are sparks in our present that can be fanned into the roaring flames of survival.” –Thank you. Very beautiful & inspiring story. Thank you!! !Shared it in a page called Dirty Laundry,Clean Dreams. Thank you very much, Vicci!